As the birthplace of cinema, France is the perfect choice when deciding where to study acting. 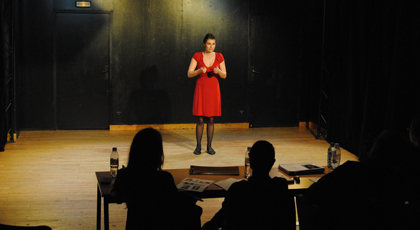 Cours Florent International courses offer students not only the chance to refine their dramatic acting skills but also to experience full immersion in the cultural and artistic life of France. The Cours Florent curriculum gives students the chance to enroll in drama classes at this world-renowned French theater and film school. They will not only have the chance to refine their dramatic acting skills but also to experience full immersion in the cultural and artistic life of France. Courses focus on the development of acting tools by applying the methods of international writers. TThe entire acting program is taught in English and includes 6 hours per week of French classes (FLE) with an emphasis on theater. Students meet numerous figures from the performing arts and film industries as well as go on organized cultural outings. In order to experience cultural life in Paris and the French art de vivre, students are able to participate in tours, conferences and workshops. They also take a French language course to acquire basic French conversation skills. Discover the famous Cannes Film Festival.